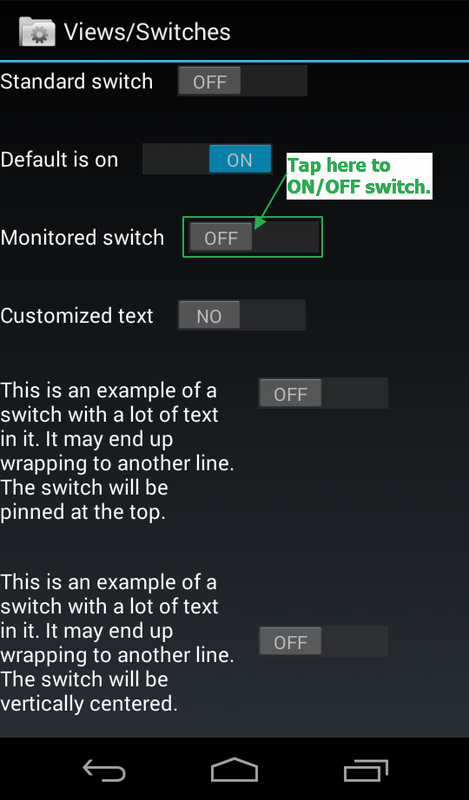 In android, There is one important element ON/OFF switch. 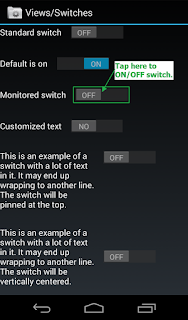 It is very easy to ON/OFF switch in android automation test using appium but you should know how to do it. In this article, I am going to described you how to ON/OFF switch in appium android automation test using tap(int fingers, int duration) method of MobileElement class. Also you can use click() method to tap on button but here we will use tap method for your understanding. We will use API Demos app in this test. You can download it from google play. In this appium automation test, We wants to tap on Monitored switch "OFF" button to switch "ON" it and then once again tap on Monitored switch "ON" button to switch "OFF" it as shown in bellow image. Also we wants to verify that switch is ON or OFF before taping on it. In API Demos app, You can manually navigate to above screen from App Home -> Views -> Switches. Create bellow given test in eclipse and run it. View earlier published APPIUM TUTORIALS if you don't know how to run appium test. // Scroll till element which contains "Switches" text If It Is not visible on screen. //Get status of switch using it's text. //If switchStatus1 = Monitored switch OFF, Execute inner code. //Locate switch button element by name = Monitored switch OFF. //Tap on switch button "Monitored switch OFF" to make it ON. //Pause test for 5 seconds to put switch ON for 5 seconds. //If switchStatus1 = Monitored switch ON, Execute inner code. //Locate switch button element by name = Monitored switch ON. //Tap on switch button "Monitored switch OFF" to make it OFF. It will open API Demos app in android device. Tap on Monitored switch to switch it ON from OFF. Once again tap on Monitored switch to switch it OFF from ON. This way you can tap on any switch of android using tap method of MobileElement class.